Noticeable works about the impact of inflation on economic growth are dated back to the 90s. the impact effects from an increase in average inflation by 10 percentage points per year are a reduction of the growth rate of real per capita GDP by 0.2-0.3 percentage points per year and a decrease in the ratio of investment to GDP by 0.4-0.6 percentage points. growth falls sharply during discrete high inflation crises, then recovers rapidly and strongly after inflation falls. Since after these papers, no highly cited paper on topic appeared. Though there's Acemoglu et al., “Institutional Causes, Macroeconomic Symptoms” (2003), which is relevant in another sense. The consensus seems to be that above a threshold of around 3%–4%, inflation imposes welfare costs, while the plausible gains from reducing inflation below about 2% are unlikely to outweigh the advantages of a positive inflation target. There is even less guidance in the literature on the optimal level of inflation in developing and emerging countries, though Balassa-Samuelson effects imply that optimal inflation in these countries should be a little higher than in industrialised countries. Our findings suggest that, on average, there is a negative long-run relationship between inflation and economic growth in India. We also find statistically-significant inflation-growth threshold effects in the case of states with persistently-elevated inflation rates of above 5.5 percent. Does the current academic consensus remain with Barro's 1995 paper? 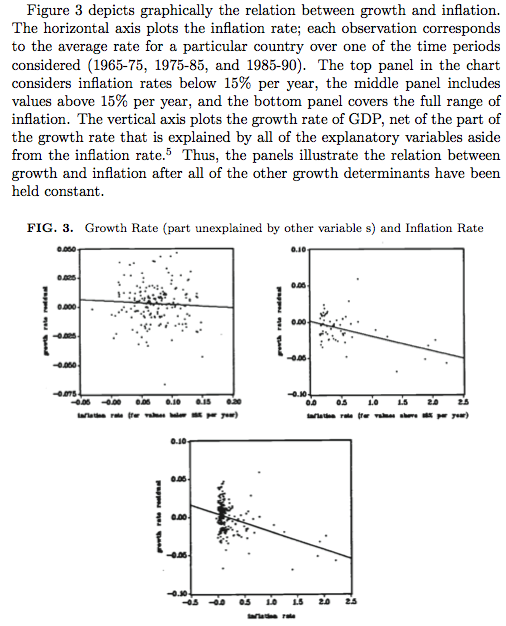 Are there any new estimates of the impact of inflation, threshold levels of inflation, and changes in inflation on long-term economic growth? In order to circumvent problem #1, people often assume that the DGP process behind different countries are the same, increasing observations from perhaps 60 to 600. In order to attack #2, many people add timing assumptions. However, this is still no clear identification, these are still assumptions. To see the issue: Imagine high inflation at $t-5$, and low growth at $t$. Using a standard timing assumption, the former caused the latter. However, we like to think about agents as forward looking. Can we be certain that expectations w.r.t. the latter didn't influence the former? Especially because of #2, this type of regressions have lost popularity. Also, there is not really much more to do. tl;dr: No important new results that I know of. If nominal wages cannot fall, then positive inflation may facilitate real wage adjustment. We examine data on individuals' wage changes and find only limited evidence of such downward nominal rigidity. The shape of the distribution of wage changes is little affected by the rate of inflation. About 8 percent of job stayers have zero nominal wage change, but we estimate that less than half of that spike represents truncation associated with downward nominal rigidity. We estimate that reducing inflation from four percent to zero would result in an additional 1/2 to 1 3/4 percent of peoplehaving constrained wages because of downward nominal rigidity, and our estimates of the associated welfare loss center on about five-hundredths of a percent of aggregate output. This article examines real and nominal wage rigidities in West Germany. Using regionally disaggregated register data for 1975–2001, we estimate the extent of both types of wage rigidities from the observed distribution of individual wage changes, taking into account possible measurement error. The fraction of workers facing wage increases that are caused by nominal and particularly real wage rigidity is substantial. The extent of real rigidity rises with inflation and falls with regional unemployment, whereas the opposite holds for nominal rigidity. Overall, the incidence of wage rigidity, which accelerates unemployment growth, is most likely minimised in a moderate inflation environment. The empirical distribution of nominal rigidities could form a basis for an optimal inflation. There are other benefits and costs of inflation, but as @FooBar points out, many may be difficult to get good identification upon. Table 3.1 summarizes all of the welfare changes that are discussed in the remaining sections of the paper. The specific assumptions and parameters values will be discussed there. With the parameter values that seem most likely, the overall total effect of reducing inflation from 2% to zero, shown in the lower right corner of the table, is to reduce the annual deadweight loss by between 0.63 and 1.01% of GDP. Not the answer you're looking for? Browse other questions tagged macroeconomics inflation academic-graduate economic-growth or ask your own question. Why is GDP growth so important that central banks are trying to impose negative interest rate? Does Economic Growth Lead to Inflation?